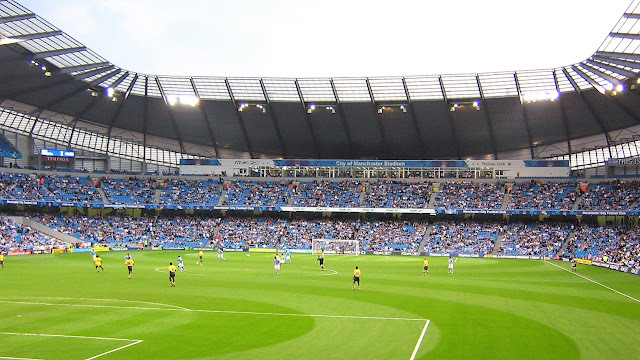 I had been planning to go to Manchester City v Chelsea on a Monday night last March, but Chelsea went through in the FA Cup and so the game was off. A most enjoyable evening was had at Curzon Ashton, a really nice club who I am glad I visited so it was maybe a blessing in a disguise that it was called off. 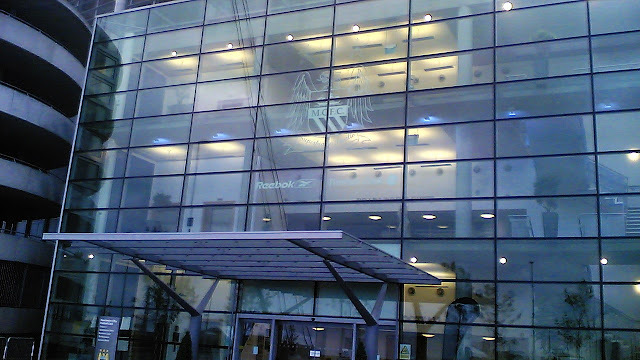 That week also saw me visit Gateshead and Everton in my first few days away up North for football. A second one was had earlier this season which saw me at New Mills, Guiseley and Buxton to add to my tally of grounds visited. For this week though, I was going all out, spending the whole week away and planning to hit as many of the 4 remaining teams out of the 92 that I had to do. I bought a ticket for the one that I thought would be most tricky - Liverpool and had firm plans to go to Burnley, though these were changed from Saturday to Tuesday at the last minute due to cup commitments. I was hoping and praying that the Man City game would be on the Sunday after they were drawn at home to Leeds, and this turned out to be the case. I thought it would be simple enough to get a ticket - after all, I had easily bought a ticket for the Chelsea game last year. But you had to have a purchase history with Man City and my refunded ticket (due to them moving the date) did not count. Try as I might - phoning the ticket office, trying to buy hospitality, trying Leeds, asking mates and trying on forums, I couldn't get one for love nor money. Well I could if I wanted to pay £87 for a £20 ticket off of some dodgy ticket tout website. And that was something that I was considering if the prices came down to £60. But I fired off a quick email to Man City, explaining the situation as posted above and posting a link to my website, not expecting to hear anything back. Imagine my shock when I got an email back, saying that my personal plea had been passed on to a manager and they could sell me a ticket after all. I just had to send them my personal details and agree to the ground regulations and they would ring me. Within a couple of minutes of sending the email, they were selling me one of the best seats in the house for £20, forgoing the usual £2.50 fee for booking by telephone. The tickets were ordered at 2PM and came next day - first class service from Man City all around. Many smaller clubs failed to reply to messages, so it was nice to see that a bigger club had a heart and cared about their customers, despite being the current Premiership Champions. Believe it or not, younger readers, but Manchester City actually used to be in League 1 along with Wycombe less than 15 years ago. They did go up at the first attempt, winning late on in the playoffs against Gillingham at Wembley They were 2-0 down with a few minutes to go until a late flourish saw them win 3-2. It was Wycombe that effectively consigned them to playoffs as we avoided relegation by the skin of our teeth. First at Adams Park in November with a 1-0 victory and then repeating the dose in late April, winning 2-1 at Maine Road, a game I sadly didn't go to due to work commitments. The match was a decent one but was over before it started really. A lovely passing move was finished off neatly by Yaya Toure who tricked Leeds keeper Simon Ashdown into committing himself before rounding him to open the scoring after just 5 minutes. It was 2-0 ten minutes later when Sergio Aguero was fouled in the box. He stepped up to the spot himself, giving Ashdown no chance in the Leeds goal. City continued to dominate until half time, but without really creating much. Half time saw some analysis on the game live on the pitch, with former City players Imre Varadi and Paul Power. It was decent to watch and with a kids game also going on there was plenty to keep you entertained during the interval. The next goal, if it came would really decide what direction the game would be going in. Leeds had made 2 changes at half time, hoping to swing the game in their favour. Though there was a slight improvement on their part it was still City in control and they further extended their lead on 52 minutes, scored by Leeds boss Neil Warnock's nemesis Carlos Tevez. The Argentinean signed for West Ham back in 2007 and there were some issues with the transfer which led to the hammers getting fined. The player's goals kept West Ham up at the expense of Warnock's Sheffield United which resulted in a legal battle with the Bramall Lane club trying to get recompense. The resulting financial issues with loss of revenue resulted in the Blades dropping down another division into League 1 where they remain to this day. The game was finished off with probably the best goal of the game on 73 minutes when Sergio Aguero neatly finished, deflecting his shot in off the post. Leeds fans had had enough by this point and started calling for Warnock's head. They had given excellent backing to their team all afternoon, with a few efforts at chanting by the home fans, but not much. Even when the goals were scored, there was more clapping than cheering, which was not what i was used to. Everyone was friendly though and there were no signs of trouble between the sets of fans, what with the massive police presence. After the game, I dropped my stuff back at the car before heading into the city centre. Last time when I went into Manchester on my week off last year, it was mainly for shops and the football museum, both of which were very enjoyable. But there didn't seem to be a huge range of the sort of pubs that I liked, ones where I can try something new. But my fears were unfounded. First stop was the Port Street Beerhouse, recommend to me by mate and fellow blogger Tom Jellis who like me loves his pubs and football. Firstly I had a half of Gwynt y Ddraig Happy Daze, which I had tried before in the Wetherspoons beer festival and really enjoyed. I then tried some Perry Vale from the same company, which in my mind was even nicer. I then took a walk to the Cornerhouse, an arty type of cafe place, just like the Chapter Arts Centre in Cardiff that I visited last December. It also shared something in common with its Welsh counterpart in they despite being listed as doing Hallet's Cider, they didn't have any in stock, so the search to try that particular one goes on. Instead, I had a light Belgian cherry beer, being cautious as I had to drive home shortly after. In the arts centre, I saw a bit of art that looked like it came from the local play school, but they were still asking £450 for it. Someone is onto a nice little earner if they can knock out stuff at that price! I got back to my car, recognising the bit near Mancunian Way where Sam Tyler 'died' and got sent back in time in the excellent BBC series 'Life On Mars. As a result, I really fancied watching a few episodes of this, but sadly my Blu-Rays and PS3 were back home, 200 miles away. Though I wasn't especially hungry, I still stopped off for a snack on the way home, getting a Keema Naan from a local take away. This set my gastric juices flowing and so after getting back to the Services where my hotel was, I got myself some gravy and chips. I then went back to my room, checking out Facebook and chatting on my phone before watching the FA Cup Highlights on ITV. Soon after that I drifted off, but had a restless nights sleep, but having had a good day. 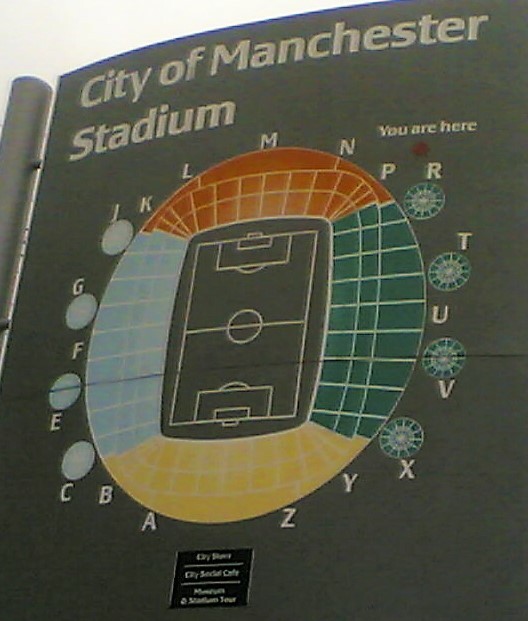 THE CITY OF MANCHESTER STADIUM was built for the. 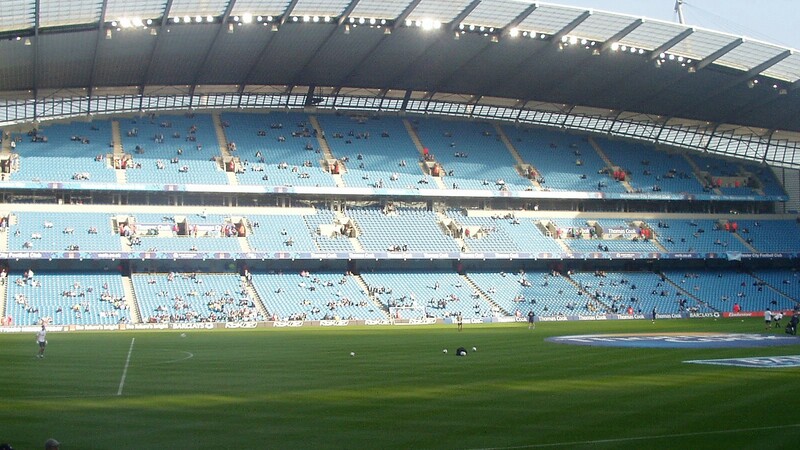 2002 commonwealth games in Manchester and soon after they finished, it was adapted for football use and Manchester City moved in. There isn't a huge amount to say about it. It is a typical new stadium, bowl-shaped as opposed to the old style of 4 separate stands. It's not as flash as some of the other new builds, such as Arsenal's Emirates Stadium, but it does its job well. Leg room and views are excellent and there are plenty of eating, drinking and betting facilities in the stadium itself. 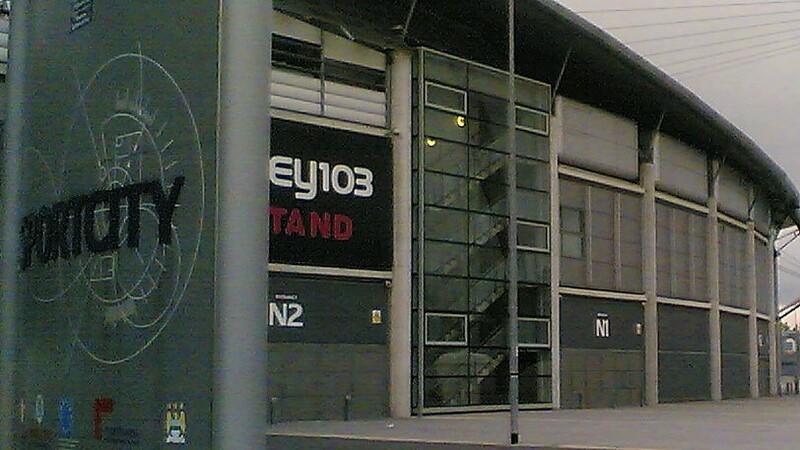 There are also several official and unofficial merchandise stalls directly outside the ground. You are better off eating and drinking outside though, there are loads of takeaway places and pubs to chose from, though the pubs tend to be home fans only. 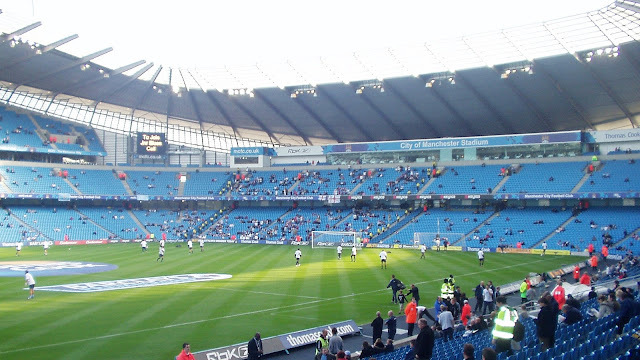 Best bet if you have time is to go into Manchester itself, which is just under half an hour walk away. For parking, I found a decent spot on Cresbury Street, around 20 minutes walk away from both the ground and the City Centre. Annoyingly I deleted all my photos from my phone by accident, thinking that they had been backed up to cloud storage. But they hadn't. So I have lost the bulk of my photos from here. Luckily I did upload one up on Facebook, plus had a couple of files on my laptop from a previous quick visit and another random source, so I do at least have a few pictures.